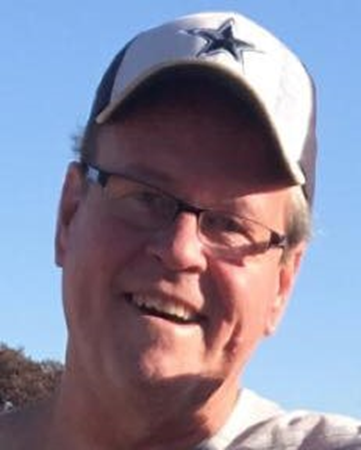 John Hallmark of Gun Barrel City, Texas passed away on January 21, 2019 at his home. He was born in Long Beach, California on May 26, 1962 to William and Iris Hallmark. John attended high school at Liberty Christian High School in Huntington Beach, California. He worked for many years in the painting industry but for the last 12 years he worked as a roofing salesman. John loved spending time at home with the love of his life, Lisa Miller and their dog Gracie. In John’s spare time he loved to fish and cook on his smoker. He also loved 4th of July as he got a big kick out of shooting off fireworks for the kids. He enjoyed helping others even when he didn’t have much to give. John was a wonderful son, brother and friend to many. He loved people pure and simple and always had a smile on his face for everyone to see. John was preceded in death by his father William (affectionately known as Pop) and his mother Iris. He is survived by his brother Jim and his wife Nancy as well as 5 nieces and 1 nephew. Aimee Baker, Melissa Neil, Briana Hallmark, Darci Fitzgerald, Landon Hallmark and Kendal Hallmark. Pastor Larry Reneau with the Clearview Bible Church will be officiating for the Hallmark family today.